A missing tooth can do more than affect your appearance and confidence. The gap in your gums can also affect the alignment of teeth and increase the risk of developing other dental conditions. Dental implants are an ideal solution for replacing teeth when they are badly damaged due to disease, decay or trauma. A dental implant is a procedure whereby a metal implant, usually a small titanium screw, is surgically placed into the jawbone which acts as a root for the artificial tooth, bridges or dentures. Over time, the metal implant fuses with the jaw bone and remains a strong support for the fake teeth. A natural tooth coloured crown is then placed over the dental Implant. 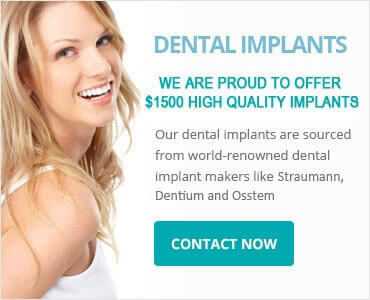 Our Sydney dental implant dentists at Tooth Implant Sydney will answer all of your questions regarding the different kind of dental implants and help you in making the right choice of procedure. Single tooth implant: Replace a single tooth, without requiring support from neighbouring teeth. Multiple teeth implant: Replace multiple missing teeth. Full set implants: Provide support for an implant denture, making it more secure and comfortable. What are the procedures included in a dental implant at Tooth Implant Sydney? First Visit: Your first consultation will include a detailed examination and treatment plan session. Our team will help you understand if you’re a good candidate for dental implants, as well as how they can improve your oral health. Our tooth implant specialists will assess your jawbone and available tissue. For this information, necessary X-rays will also be ordered. For smaller teeth, front teeth, pre-molars, and for patients where bone tissue density is low, mini dental implants will be considered. Second Visit: During this visit, the dental implant will be inserted during a minor oral surgery that generally takes 30 to 60 minutes. Before this procedure, the damaged tooth will be removed, if present. If there is no tooth present, the gum is prepared by numbing it and then sliced and folded back to allow the bone to be drilled to receive the dental implant. A healing cap is then inserted and a temporary tooth is provided during healing. The dental surgeon will usually wait for 2-4 months before proceeding with the next procedure. Third Visit: After the healing is done, we will commence on the final stages of preparing the gum tissue and finally the crown or bridge. X-rays will be done by our oral surgeon to ensure that the implants have fused with the bones. If the surgeon finds that the implant has been integrated well with the jawbone, the dentist can start constructing the crown or bridge by making tooth impressions. In some cases an abutment or collar is placed to allow the gums to further heal correctly. Final Visit: The visit is to permanently insert the new crown or bridge. For more information on dental procedures, and prices call us on 1300 850 072. Our team can answer your questions on the different treatment options available and book a consultation with one of our experienced Sydney dental implant dentists. If you have a missing tooth a dental implant is the best solution to get back your beautiful smile. At Tooth Implant Sydney we offer reliable tooth implants Sydney and our reputation for high quality services has helped us become the most recommended dental facility in the city. We have a team of highly trained dentists offering custom dental solutions based on the condition of your jaw bone. Our commitment is to give you back that natural smile using a permanent dental implant. A dental implant is a permanent solution which involves fixing a titanium post on the jaw bone. The post ossifies into the jaw bone with time to form a permanent and strong base for a replacement crown. Our dental implants Sydney are carried out over a period of several months to allow the titanium post to fuse with the jaw bone. Once the post is in place a custom-made crown is then fitted to give a natural impression. The crown is not noticeable and no one can tell the difference between your natural teeth and the implant. Whether you have lost your tooth through injury or decay our dentist will evaluate the state of your dental outlook before starting the procedure. Our dental implant Sydney includes the initial consultation where your dentists will provide a detailed treatment plan. An initial assessment using X-ray and other tests is done to confirm you are a good candidate for the dental procedure. Your jaw bone must be healthy the gum tissue should be enough to cover the titanium post. Once the doctor is satisfied the implant is fixed during a minor oral surgical procedure. For the next 2 to 4 months the gum is allowed to heal before a crown or bridge is fitted depending on the number of teeth being replaced. Dental implants feel and look like natural teeth and they require the same dental care. You should come for regular dental checkups and maintain proper oral hygiene. A healthy diet is also important to maintain your teeth in perfect shape. At Tooth Implant Sydney we have specialists in dental implants and we have invested heavily in modern equipment to guarantee safer and more effective dental implants. Dental implants not only give you back that beautiful smile but also protect your jaw bone. Our services include single tooth implants, multiple teeth implants, and full-set implants. Whatever dental concern you have, give us a call today and let us get your smile back. At Tooth Implant Sydney we have a state-of-the-art clinic where we use cutting edge technology to provide excellent services. Our commitment is to always deliver beyond your expectations and this has helped us build a solid reputation as the dental implant specialists of choice in the area. Implant X-rays help dentists to look at how the implant, abutment and crown fit together and make sure that there are no problems. It provides the clear view of your implant in the bone, the abutment and the crown. Possible complications like bone injuries are identified using the implant X-rays and enables your dentist to see where the nerve is located and minimise the possibility of injuring the nerve. Special X-rays are also taken before your surgery to help your surgeon to determine where your nerves and sinuses are located to avoid the risk of drilling through the jawbone into one of your sinuses.